For many years I have half joked about the fact that on my bucket list was this; that I would be arrested for doing something righteous, Christ-like, aka – not drunk and disorderly conduct! I guess in some ways that motivation makes this ‘all about me’. Other than the fact that my desire was for it to be for something Christ-like, aka – ‘all about others’ 🙂 Following? We could stop and have a long discussion about what percentage of my motivation was ‘ego’ (all about me) and what percentage of my motivation was ‘all about others’, but I am thinking that this is hard to measure, and is not my purpose here, I will make some related comments later, but first – some history. 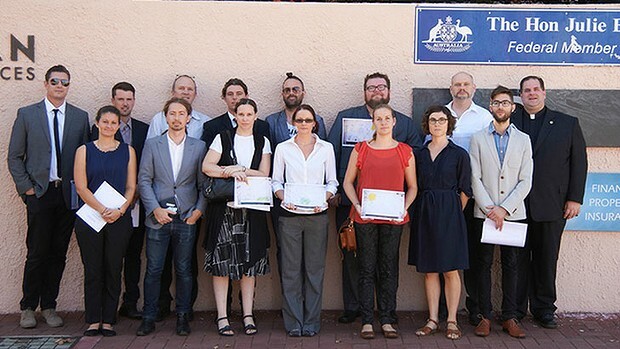 I have been disturbed for some years on Australia’s treatment of asylum seekers and refugees. Even more so with Abbott’s “Stop The Boats” and “No Way” campaigns. But in 2004 the challenge to the Government from the Human Rights Commissioner was to release children from detention, see this amazing challenge from them here. And what has disturbed me is that, today, there are more kids in detention (1138 kids in detention) than in 2004. There is a 14 year old boy still in detention in the Port Augusta residential housing project. Between April 2002 and July 2002, the boy (then detained at Woomera) attempted to hang himself four times, climbed into the razor wire four times, slashed his arms twice and went on hunger strike twice. This boy’s mother was hospitalised due to her own mental illness during this whole period. Then there is the case of a 13 year old child who has been seriously mentally ill since May 2002. This boy has regularly self-harmed. In February 2003 a psychiatrist examining the boy wrote: ‘When I asked if there was anything I could do to help him, he told me that I could bring a razor or knife so that he could cut himself more effectively than with the plastic knives that are available.‘ Mental health professionals have made more than 20 recommendations that this child be released from detention with his family. But he is still there. When I saw that some Christians had approached the Minister for Immigration’s office in March of this year (2014) demanding an answer as to when kids would be released and were arrested for their actions, I was excited. Not only was someone screaming loudly about this issue but it was a group of fellow believers including a mate of mine, Jarrod McKenna. 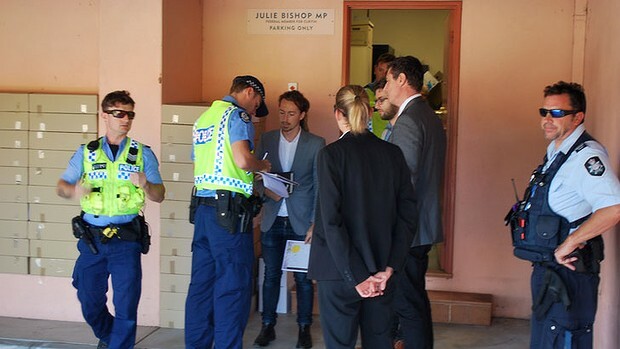 When the opportunity came to be involved in a similar event here in Perth at the Subiaco office of Julie Bishop (Deputy PM and Minister for Foreign Affairs), I didn’t have to pray and contemplate for very long at all. History has been filled with people who have followed in like manner, look at Gandhi and look at Martin Luther King Jnr. In fact it was King’s model that was referred to in much of the training in the lead up to this event. We were encouraged to read the letter King posted to christian leaders who were critical of his actions in being repeatedly arrested for his stance against segregation. 1. Collection of the facts, is this really happening? 2. Negotiation. This has been happening for a decade with no response as to when kids will be released. 3. Purification, times of prayer and preparation for those committing to the action, particularly around committing to non-violence and peace. One of the questions many have asked me, even challenged me on since the event, was around the ‘showing off’ of the event on social media. Every newspaper clipping posted on someone’s site, every mention of it splashed around the Twittersphere – were they not just another way of saying “look at me, I got arrested”? Were they not just a form of ego massage? For me? YES!! and NO!! I would be a liar of I denied that there was ANY sense of self back patting in this past week. I would be a liar if I hadn’t felt the ego swell when yet another text or Facebook message came in. BUT – as a team, from the very beginning we named this, we held each other accountable, keeping our celebrations in check and focused on the issue, and more than once a text or call has been shared at an accountability level since the event. This was a drama and we were the ‘lead actors’! This was meant to gain maximum media coverage and attention. The bigger it was the better it was. This was not about 11 people being arrested, this was about WHY 11 people were arrested, WHY 11 people trespassed on Federal Government land – This is still about 1138 Children in detention centres! Does not Paul’s letter to Rome tell us to obey the laws of the land? One may well ask: “How can you advocate breaking some laws and obeying others?” The answer lies in the fact that there are two types of laws: just and unjust. I would be the first to advocate obeying just laws. One has not only a legal but a moral responsibility to obey just laws. Conversely, one has a moral responsibility to disobey unjust laws. I would agree with St. Augustine that “an unjust law is no law at all.” Now, what is the difference between the two? How does one determine whether a law is just or unjust? A just law is a man-made code that squares with the moral law or the law of God. An unjust law is a code that is out of harmony with the moral law. To put it in the terms of St. Thomas Aquinas: An unjust law is a human law that is not rooted in eternal law and natural law. Any law that uplifts human personality is just. Any law that degrades human personality is unjust. Did You Know The Minister Would Not Be There? Yes, we knew she was in Mexico, and that the chance of ever finding her in her Perth office was slim. But this is her office, her representation, they advocate for her. She and her wider staff and junior ministers are in constant contact with this site. Remember this is about dramatizing the cause. In some senses, if we had got an answer from her or through her office regarding a date for a release of kids in detention, or even a “no” we wont release them, we may have been very shocked! The question has been asked since kids have been sent to detention here in Australia and never been answered, the courts and the Human Rights Commission are still asking the question we asked. Underlying our question was a desire to highlight that very question to Australia (and now the world as people such as Claybourne and Campolo are posting about this and the action in Sydney at Morrison’s office on their sites in the USA). So her not being there was almost beside the point, obviously if she was present it would have been a bonus but I wonder if we would have even got near the reception due to security. Was this not just a waste of tax payers money? And the 5 billion dollars we spend on keeping people detained each year is not a waste? I don’t know what the cost our actions would have been to the public Monday. There were more than 20 police and support staff involved, so yes, there would have been a cost. But the truth is that if every person in detention today was released into the Australian community and claimed Centrelink for a year, (unlikely as many would jump in and start working and begin to pay tax), but if they all did, the cost of their living in our communities would be about $500M ! We would be saving $4.5B a year. I think our action and the publicity it gained was money well spent. M.L. King refers to a double victory. Did you have to take it to the point of arrest, why not just get kicked out? One of the police officers asked me this after we were offered the chance to get out and chat with the press via a “move on notice”. I responded by saying that if we were there protesting bad recycling practices in our local suburb or some other such lesser issue we may take the offer. But this issue – kids in detention – was too big for a move on notice, it required an arrest and we would stay until removed by arrest. It is interesting to note that the officer agreed with me. We were arrested. We were taken to Northbridge lockup for the afternoon. Processed (finger prints etc) and released on $0 bail with an order to not approach Ministers of Government until our court appearance on May 2. Are there not legal avenues to get these kids out? In July 2002, the Family Court of Australia ordered the release of five Afghan children from Baxter Immigration detention centre. The children were being held there with their mother (and later their father was also detained). The children were released into community care, separate from their parents who remained in detention. [But] the Minister appealed this case on the grounds that the Family Court had no jurisdiction in this area. This was upheld by the High Court in 2004 (Minister for Immigration and Multicultural and Indigenous Affairs v B and B  HCA 20). The children’s ongoing detention was deemed lawful under the Migration Act. It was found that sections 189 and 196 of the Migration Act make no distinction between unlawful non-citizens who are under or over the age of 18 and such matters were not relevant to the Family Courts. In October 2004, without having to address any areas of Family Court jurisdiction, the High Court again found that it was lawful to keep children in continued immigration detention in the case of Woolley (Woolley; Ex parte Applicant M276/2003 (by their next friend GS)  HCA 49). The Parliament affirms as a principle that a minor shall only be detained as a measure of last resort. What Would Happen to These Kids If They Were Released? A great question that must be asked, and one of the most often asked questions to me since the event last Monday. 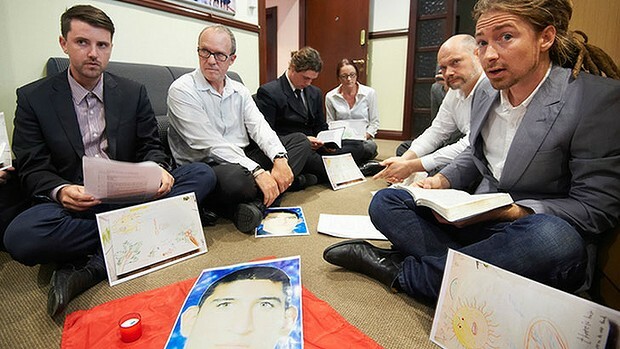 The Uniting Church in Australia has offered to care for all the children currently in detention on Christmas Island. The Baptist Churches in NSW have offered hospitality to over 80 people being transferred from Villawood. The reality is that churches in Australia have more than sufficient resources to facilitate community-based care for all the children currently behind bars. Our elected leaders only need to respond to our invitation. Australian people of all faiths and none will respond with creativity and compassion. 1579 are detained in the community under residence determinations. The statistics do not give a breakdown of how many children are unaccompanied vs how many are with adult family members. You may be troubled by our actions. But ask yourself which is more troubling – the peaceful tradition of Christian civil disobedience, or the 1138 children who are in prison indefinitely? There will be another gathering, a show of support for the 11 arrested as they appear in court, but most importantly a stand against our Government’s decision to keep 1138 children in detention centres. 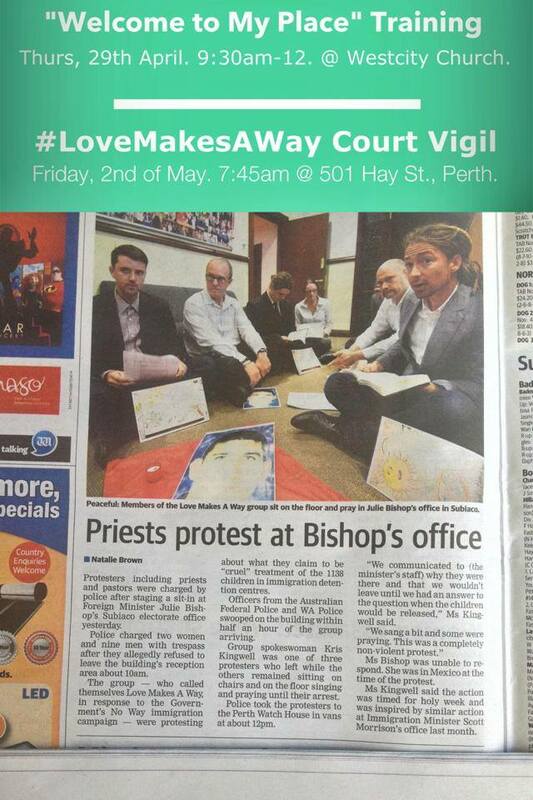 We will gather outside the court on May 2 at 7.45am. 501 Hay St Perth. I recommend a half day training event on Thursday 29th April 9.30am – 12 at Westcity Church Wembley. They [boat people] make up less than four per cent of people who come to Australia seeking asylum, yet never fail to generate an astonishing political and media storm. So here are some facts: more than 96 per cent of asylum seekers arriving in Australia step off planes, not boats. Furthermore, the vast majority of boat arrivals are typically found to be genuine refugees – those fleeing for their lives and safety, not simply seeking better lives in wealthier nations. Far from being “illegal immigrants” they are exercising the right to seek asylum under international law. Yet right now our Government is actually considering paying Indonesia, a country which has not signed the UN Convention on Refugees, to swoop in on people desperately seeking refuge in Australia before we’ve even had a chance to hear their claims. In Indonesia, this group of asylum seekers, including a pregnant woman and several children, will be placed in immigration detention until they are processed by the UN Refugee Agency (UNHCR). Despite financial assistance from the Australian Government and the International Organisation for Migration, Indonesian detention centres are over-crowded and under-resourced. Asylum seekers in Indonesia face arbitrary and indefinite detention until the UNHCR processes their claims. Amnesty International is concerned that the UNHCR has limited capacity in Indonesia and asylum seekers may be forced to spend extended periods in detention while waiting to apply for refugee status. Refugees in Indonesia do not have the right to work, send their children to school and have no recourse to a more permanent status. Their only hope of a durable solution is to be selected for resettlement to a third country through the UNHCR, a process that can take more than six years. I got this email today from a mate who is “in the know” regards outdoor stuff around Perth. This sounds like great news! Just in case you haven’t heard, the Munda Biddi Foundation was successful in it’s applicant for a Royalties for Regions grant for $3,000,000 (million!!). This a brilliant result and vindication of the huge amount of work put in by a large number of people in both government and community. It is the result of cooperation, support and of a shared goal and ideals. This means that the Munda Biddi can be be completed all the way to Albany from its current terminus at Nannup. The Bibbulmun Track Foundation also received some grant monies for upgrades, particularly in the Nullaki Peninsula area. Thank you to some of the unsung heroes of the Trails movement, you know who you are, who worked tirelessly on this proposal and gave it the support it needed to get through the applicant process. I won’t name anyone at the risk of embarrassing them, or missing someone out! It would not have happened without you. Now Western Australia will have two Long Distance Trails of world class significance and quality that will bring joy, companionship, adventure and a chance to experience the wild for many future generations. The Tall Man by Chloe Hooper was my best read of the summer holidays, a book I could not put down. If you love court room type investigative dramas you will love this true story. On the 19th November 2004, Cameron Doomadgee swore at a police officer. The 36-year-old aboriginal resident of Palm Island off the coast of Queensland near Townsville was arrested by Christopher Hurley and 40 minutes later was found dead in a cell of the local police station. In January 2007 Hurley was charged with manslaughter, the first Australian police officer to be charged over a death in custody. He was acquitted in June 2007. I wept as I read the last chapter of this brilliant book. I know a country copper, a tall , big guy, who I know ‘roughs up’ people a bit, could he do something like this when his temper is pushed to the limit? Would you? Would I? But more than all these questions about our temper and what it can produce, I was challenged by white Australia’s attitude to our indigenous people, the first Australians. Sadly the verdict was handed down just 24 hours before Howard marched the army into the Northern Territory as part of that government’s intervention and ‘answer’ to The Little Children are Sacred report, so most of the drama of it all was lost, but I do remember the news about the riots in 2004 and subsequent reports.